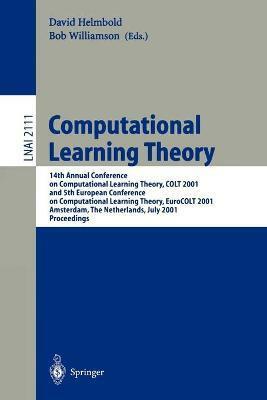 This volume contains papers presented at the joint 14th Annual Conference on Computational Learning Theory and 5th European Conference on Computat- nal Learning Theory, held at the Trippenhuis in Amsterdam, The Netherlands from July 16 to 19, 2001. The technical program contained 40 papers selected from 69 submissions. In addition, David Stork (Ricoh California Research Center) was invited to give an invited lecture and make a written contribution to the proceedings. The Mark Fulk Award is presented annually for the best paper co-authored by a student. This year's award was won by Olivier Bousquet for the paper "Tracking a Small Set of Modes by Mixing Past Posteriors" (co-authored with Manfred K. Warmuth). We gratefully thank all of the individuals and organizations responsible for the success of the conference. We are especially grateful to the program c- mittee: Dana Angluin (Yale), Peter Auer (Univ. of Technology, Graz), Nello Christianini (Royal Holloway), Claudio Gentile (Universit'a di Milano), Lisa H- lerstein (Polytechnic Univ. ), Jyrki Kivinen (Univ. of Helsinki), Phil Long (- tional Univ. of Singapore), Manfred Opper (Aston Univ.) , John Shawe-Taylor (Royal Holloway), Yoram Singer (Hebrew Univ. ), Bob Sloan (Univ. of Illinois at Chicago), Carl Smith (Univ. of Maryland), Alex Smola (Australian National Univ. ), and Frank Stephan (Univ. of Heidelberg), for their e?orts in reviewing and selecting the papers in this volume.